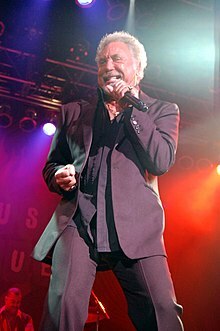 Sir Thomas John Woodward, OBE (born 7 June 1940), known by his stage name Tom Jones, is a Welsh singer. He has won Grammy Awards. Jones is particularly noted for his powerful voice. He released his first album Along Came Jones in 1965. He has released thirty-nine studio albums since then. He released his most recent album Spirit in the Room in 2012. He was born at 57, Kingsland Terrace, Treforest, Pontypridd, South Wales. Jones was married to Linda from 1957 until she died of cancer in 2016. He has a son (born 1957) by Linda. He has a son (born 1988) by another woman. ↑ "Tom Jones Biography". Contactmusic.com Ltd. Retrieved 20 February 2016. ↑ "Tom Jones biography part one". BBC. Retrieved 20 February 2016. This page was last changed on 11 March 2018, at 05:03.